In the early spring of 1953, a sickly Russian novelist, covered with ice, out of the dark and the cold, staggered forth from the Soviet Gulag, the constellation of Communist prison camps that stretched from Siberia to South Asia. Aleksandr Solzhenitsyn, ill with cancer, had once been a proponent of the system that condemned him to forced labor. Now he saw his nations deep suffering, like his own, as redemptive. The entire twentieth century, Solzhenitsyn observed in his 1983 Templeton Lecture , was sucked into the vortex of atheism and self-destruction. Why? Men have forgotten God, he said. At the outset of the twentieth century, the faith of the Russian people could be witnessed even in the trenches of the Great War, where the Germans would gun down thousands of Russians by day only to listen in wonder at their seraphic, if melancholic, chant by night. But when war and famine proved too much to bear, the Russian people rebelled. Decades earlier, Dostoevsky had prophetically warned that great events could come upon us and catch us intellectually unprepared. Those events came swiftly in Russia. The Bolsheviks, the most organized and ruthless of the factions that vied to replace the old regime, emerged victorious. Solzhenitsyn wrote of Marx and Lenin, Hatred of God is the principal driving force, more fundamental than all their political and economic pretensions. Nowhere was this more evident than in the Bolsheviks systematic campaign of atheistic violence”unprecedented in human history. Alexander Yakovlev, a Communist who became disillusioned following Khrushchevs 1956 speech denouncing Stalin, documented the terror perpetrated against Russias Orthodox Christians in his book A Century of Violence in Soviet Russia . Almost immediately upon the Bolshevik seizure of power in 1918, the clergy were purged. The Metropolitan of Kiev was mutilated and castrated, his naked corpse left to be desecrated in the street. The Metropolitan of St. Petersburg, in line to succeed the Patriarch of the Russian Orthodox Church, was doused with water and left to freeze to death, a pillar of ice. A bishop was strapped alive to the paddlewheel of a steamboat and mangled by the rotating blades. One archbishop was buried alive; another was crucified and burned to death. Three thousand members of the clergy were shot in the first year of the Russian Revolution. All these Christian martyrs went unswervingly to their deaths for the faith, Solzhenitsyn noted. Tens of thousands of religious would be sent to concentration camps; few returned. And the worst was yet to come in the 1920s under Stalin. Today there is a revitalization taking place in Russian culture and, as with the Renaissance in Western Europe, it is being spearheaded by institutional Christianity. This renaissance is perhaps best captured in the work of Metropolitan Hilarion Alfeyev, a celebrated historian, philosopher, theologian, and composer who is only forty-seven. Like Solzhenitsyn, Alfeyev strives to fill the cultural void of Russias lost century, and does so with indefatigable energy. This can be heard in his St. Matthew Passion , a sublime orchestral and choral piece that seems to hasten with desperation to recapture time lost. Like the martyred Metropolitan Veniamin of St. Petersburg, Alfeyev is a leading candidate to become Patriarch of the Russian Orthodox Church. While he is, like Solzhenitsyn, unapologetically Russian, Alfeyevs worldview has been shaped significantly by his exposure to the West, where he has lived and traveled widely. He also has close ties to the Vatican, and represented the Russian Orthodox Church at the installation of Pope Francis. His worldview is not limited to Russia, nor indeed to Orthodox Christianity. In 2012, Alfeyev challenged Russian President Vladimir Putin to make his first priority in the Middle East the protection of Christians. So it will be, Putin replied. Alfeyev has since called upon the international community to create a mechanism [in] defense of Christians in the Middle East, which would make economic aid contingent upon guarantees [of safety] for Christian minorities. His global outlook and rise to preeminence are belied by his humble path to the Russian Orthodox hierarchy, which began in a location that both Dostoevsky and Solzhenitsyn would have found fitting”a monastery. As Scott Mark Kenworthy observes in The Heart of Russia , Dostoevsky portrayed the monastery as the locus of the peoples lived religion, and in Russia today it is experiencing a resurgence undetected by most Westerners. The throngs of faithful who stand in procession before icons at Russias shrines and churches testify to this revitalization. Today Russias streets are torn by rampant alcoholism, abortion, suicide, and drug addiction”the causes and consequences of a century of violence and dehumanization. A recent report suggested that half a million annual deaths were directly related to alcohol. Soviet Russia became the first country in the world to legalize abortion in 1920; by the end of the twentieth century, the annual number of abortions exceeded the number of live births. Russias suicide rate is perennially among the highest in the world. And according to the UN Office on Drugs and Crime, more than two million Russians are addicted to heroin, which has in turn led to the rapid spread of HIV. These factors have, of course, contributed substantially to the demographic crisis that Russia faces today: Since 1991, Russias population has decreased by roughly half a million people each year. However, all of these trends have begun to correct slightly in recent years, as demographer Mark Adomanis and others have noted. This correction is largely due to the work of the Orthodox Church. While Russia might have looked to the West for some effective methods of curbing its social challenges, such as crisis pregnancy counseling centers and substance abuse programs, it has taken the initiative to address these issues on its own. Svetlana Medvedeva, wife of former President Dmitri Medvedev and an adult convert to Orthodox Christianity, continues to work in conjunction with the Russian Orthodox Church to promote pro-life and pro-family policies. This work met with success when, in 2011, Russias parliament passed a law restricting abortion to the first trimester. The parliament has taken similar steps in recent years to curb premature deaths due to alcoholism and smoking. The trends appear to be positive, though there is much work ahead. St. Petersburgs Church of the Savior on Spilled Blood was built to honor Czar Alexander II, known as the Liberator, who was assassinated there in 1881. Alexander had survived the first explosion engineered by his assassins but emerged from his armored carriage to tend to the wounded, only to be struck by a second blast, leaving the snow-covered ground riddled with blood, debris, and the dying czar. Nearly 130 years later, I sat outside the Church of the Savior on Spilled Blood and listened to a string trio perform classical pieces. As evening gave way to night in the St. Petersburg summer, a young woman approached and began shrieking and making guttural noises. She then cackled in a kind of maniacal despair and continued on her way. The contrast captured Russias brokenness and beauty: two responses to the same suffering. Solzhenitsyn had witnessed this same despair upon his return to Russia in 1994, following the collapse of Soviet Communism; it did not break his spirit. 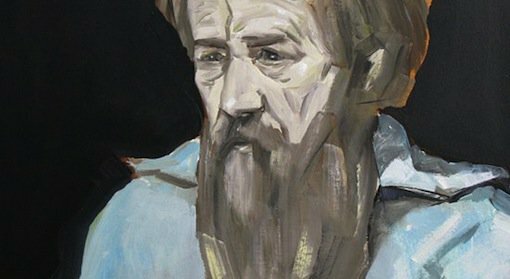 In the Gulag, Solzhenitsyn had found hope, and he never relinquished it. As Joseph Pearce noted in his biography, Solzhenitsyns life spanned from the Revolution to the collapse of the Soviet Union. He also lived long enough to witness the beginnings of rebirth. He died in his beloved Russia a free man on August 3, 2008. The spiritual blaze he had spoken of in his largely ill-received Harvard address in 1978 began in Russia through art”unexpected branches of Beauty that fought their way up through the Communist wasteland to convey an old truth that had been lost. In Solzhenitsyns Russia, after much bloodshed and suffering, men have begun to remember God. Andrew Doran served on the Executive Secretariat of the U.S. National Commission for UNESCO at the U.S. Department of State. His views are his own. Image credit: Krasnal Bansky.